On the 4th Day, there was Aziza, Layla, Nailah! Today's story is about four Arabian horses that came to AAE in early 2015. It was back in fall of 2014 that AAE got a call from Janis Jones about several horses left on a ranch after the passing of their owner. It turns out, there were four beautiful bay mares and a gorgeous black stallion. These were the last of the horses at Coffey Arabians. 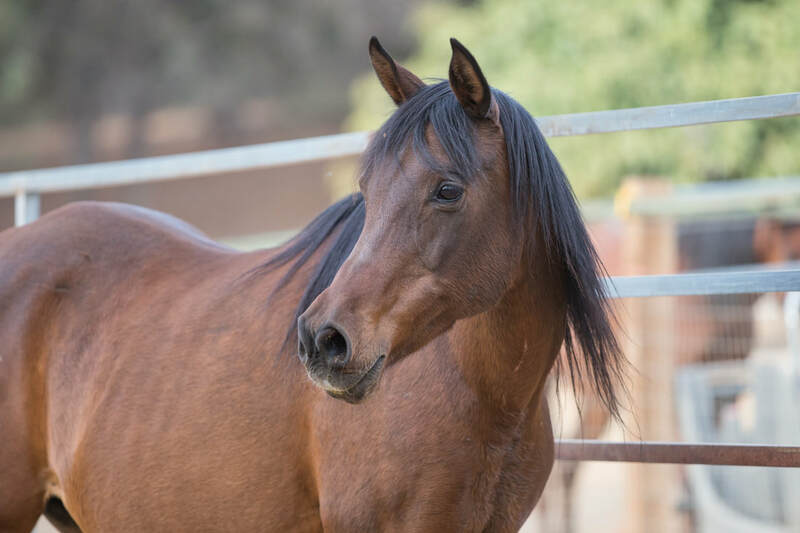 Janis Jones, the former Mrs. Michael Coffey, assisted AAE in this rescue and ended up adopting the black stallion (now a gelding). Per Dr. Jones, "The Coffeys were known as one of the finest breeders of Egyptian Arabians in the United States, and these mares are most probablyof the Shiko Ibn Sheikh line, a line known for beauty and performance". Mr. Coffey passed without a will or trust, and the horses were caught up in probate. An administrator was appointed to oversee the estate, but there was no information about the horses. No records of care or feeding practices, no veterinary history, no pedigrees, nothing. No one knew who the horses were, how old they were, whether they had any health conditions or special needs. However, it appeared they had lived on the ranch's 80 acres of lush green pastures without much care. Layla was very social and interactive from the start. It didn't take long for her to settle in at AAE and enjoy all the attention she got from volunteers..
Aziza was another story. When we brought her back to AAE, her hooves were in really poor condition, and we weren't sure we could help her. After spending some time with her the first evening, she shook like a leaf on a tree, and her eyes were wrinkled with fear. It wasn't until the first touch we both sighed with relief. That was the moment we promised her we would never give up on her. It was a big commitment. She could barely be haltered, let alone handle her hooves. The journey had just begun. We had the vet out, and sedation became our friend. We took radiographs of her hooves before trimming and shoeing. Poor girl, the rotation of her coffin bone was substantial. The journey was long, but these girls were ready for adoption. However, turns out they were older mares, and they were so bonded. After all, they'd run together on their 80 acres all of their life. It didn't take long to realize these three needed to stay together. When introduced to the herd at AAE, they kept their distance from the other horses. They had a place on the hill where none of the others would go. That was their hill, their place,they weren't bothered. Months passed, then a year, then two, and they never integrated with the herd. With each month and year, the need to keep them together grew. FINALLY, one recent day, our prayers were answered! Our three girls found their forever together home, and we couldn't be more grateful to the incredibly kind and caring family that opened the doors to make this possible. Layla, Aziza, and Nailah, you touched us all, and we'll miss you every day, but we're so happy you finally found forever together!